Best bars are the sort that don't even feel like bars. You know what I mean: the sort of bars that are sufficiently small and intimate; equipped with great staff and superb regulars so it feels as if you're just hanging out at a friend's place. That's exactly what our Bar Bhangra is. As one of the bar maids moved on to another bar, we all got together for a going away picnic. Unlike everywhere else in Helsinki, our tragically unhipster household did not wake up to a crippling Flow-hangover: I was up before 8am, baking a pie. See, life doesn't get much less hipster than that! Tomato, basil and ricotta. That's a trinity that is well and truly holy. See, there are things Italians can organize. You know, apart from crime...! The crust is the recipe that I've used for caramelized onion galette and kale quiche. This time I used 3 dl of all purpose flour and 0,75 dl rye flour. Rosemary oil (recipe here!) 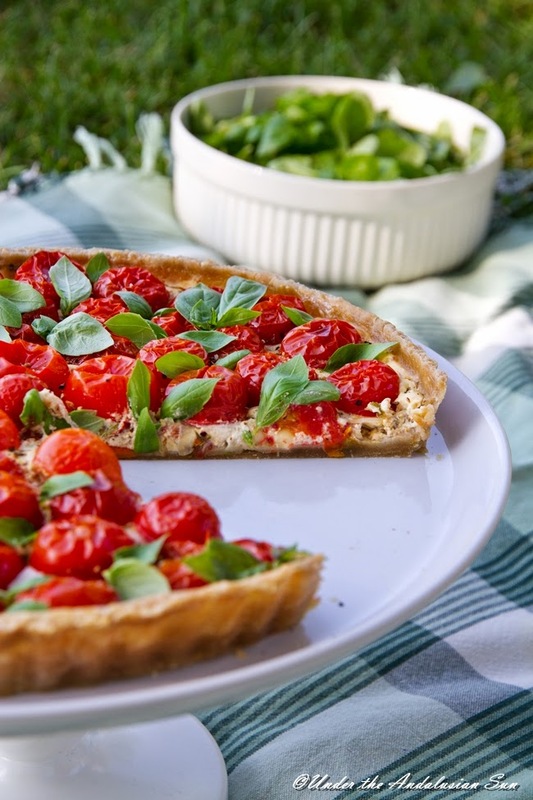 gives it lovely herbiness which compliments the Mediterranean flavours of the tart. Since the filling has quite a bit of moisture in it, I blind baked the shell first: 10 minutes at 175° covered with foil and baking beans followed by 5 minutes without the foil. Whether or not you sauté the onions first is up to you but the new harvest onions you get i the summer are milder and sweeter so there's really no need for that. 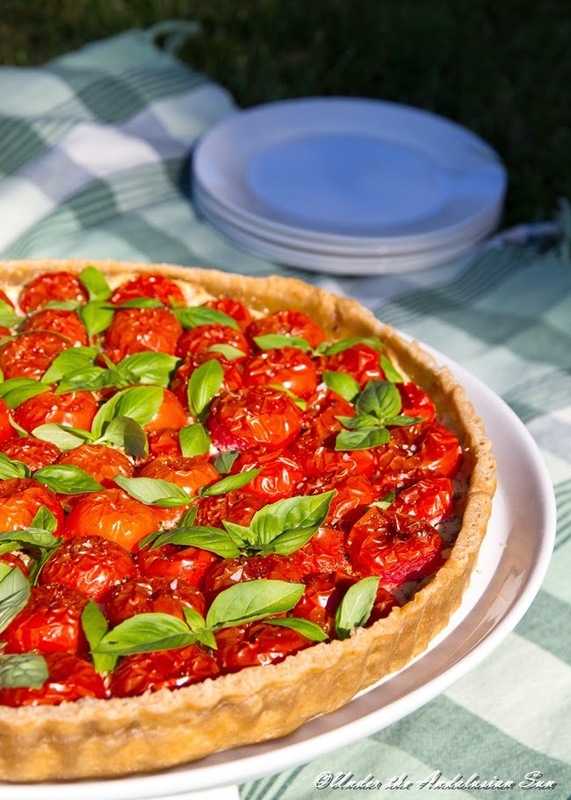 Instead of cherry tomatos you can use regular ones, cut into 1 cm slices (depending on the size you'll need 6-8). You can also use whole cherry tomatos in which case you'll about a kilo. Don't forget to prick them with the tip of a sharp knife before they go in the oven to stop them from bursting. You'll find the recipe for the crust here. The recipe is enough for 28-cm fluted tin. Mix the ingredients and spread onto the cooled pastry shell. Peel and finely slice the onion and spread on top of the ricotta layer. Cut the cherry tomatos in half and place on top of the onions. Bake at 200° for 30-40 minutes. Cool and serve.